Problems brought about by unbridled use of natural resources, high dependence on conventional sources of energy and inefficient water management may be tackled by adopting appropriate technologies, suited to the characteristics of the environment and community inhabiting these regions. These would include using alternative sources of energy, local power generation using renewable sources of energy, appropriate construction techniques incorporating traditional practices, alternate irrigation techniques, solutions for waste & water management, etc. Pragya strives to adapt and or develop suitable technologies for the sustainable use and efficient management of the natural resources of ecologically sensitive regions. 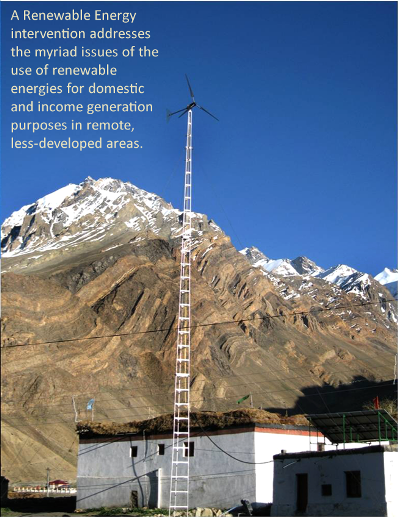 A Renewable Energy intervention addresses the myriad issues of the use of renewable energies for domestic and income generation purposes in remote, less-developed areas. Water management is another thrust area. In irrigation, Pragya is experimenting with new technologies for water harvesting, developing new methods for moisture conservation and infusing improved technologies for water distribution. We are also addressing the problems of drinking water and sanitation, with the design and establishment of rural filtration systems, rural domestic water supply systems and eco-sanitation systems. >> Solar power plants installed in remote hamlets of rural Uttarakhand India ensuring energy-sufficiency for household. >> Toilets in Nepal have been constructed to ensure hygiene and sanitation in the rural areas affected by disaster. >> Solar light units and water tanks have been installed in the community halls across 10 villages under road safety project in Lahaul and Spiti, India.